It's been raining here in L.A. for about four days straight and, unfortunately, that has put a damper on my ability to take some new photos for my blog. This look is one that I was able to photograph the day before all of the storms hit our area. 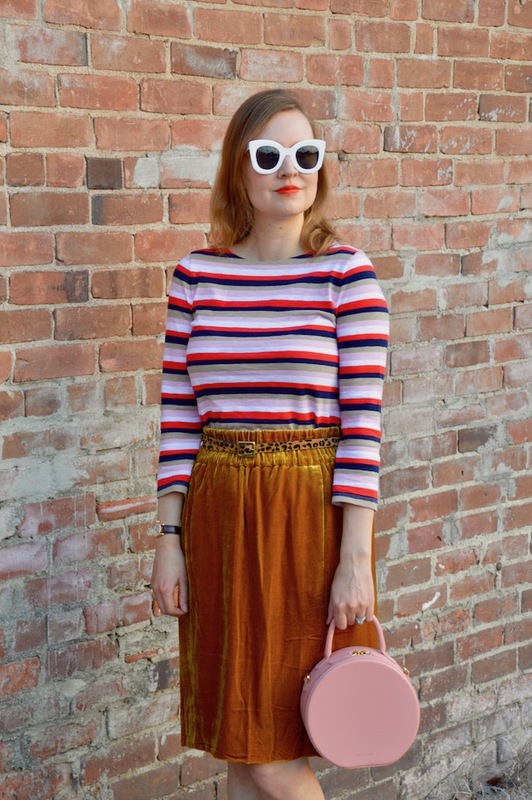 I found this striped top a couple weeks ago at my brick and mortar J. Crew store and, because it was such a great deal, I had to add it to my stripe tee collection. (I actually have an entire dresser drawer filled with striped tees of both the short and long sleeve variety!) 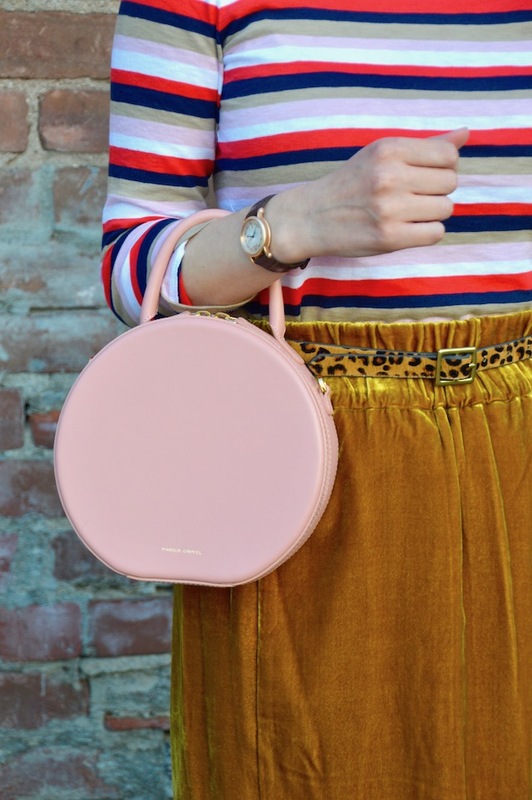 This one caught my fancy because I liked how it mixed pink and red together, which is an unexpected but perfect color combo, in my opinion, especially with Valentine's Day right around the corner! 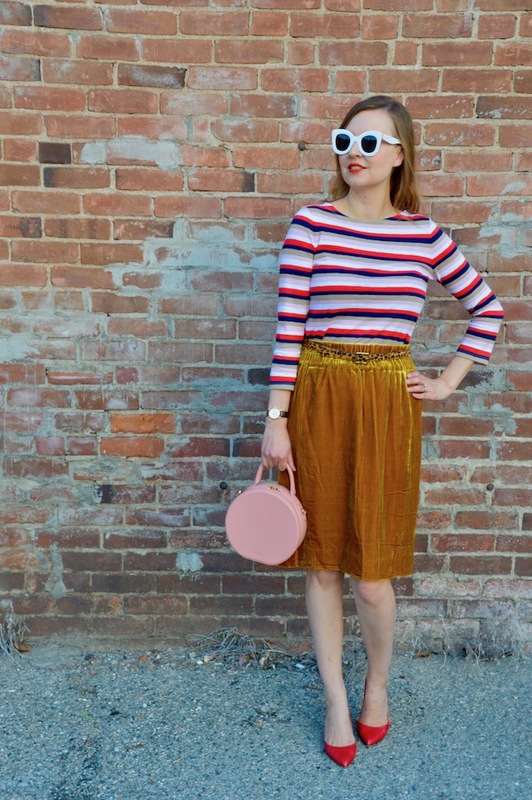 This velvet skirt happened to be a great match for my striped tee! I love the rich golden color and the easy relaxed fit. Plus, who doesn't like velvet? Truth be told, I sometimes find myself just running my hand over the fabric during the day because it's so soft and comforting! In fact, I liked this skirt and the velvet fabric so much that I also bought a star version of the skirt this year right before the holidays! I'm a big fan of anything that looks elegant but that can just be thrown on in a pinch. To tie the look together, I opted for this leopard belt for just a little added pattern. You really can't go wrong with stripes. It's such a beautiful print no matter what type of clothing item it's on. It's just very attractive. I don't own velvet but can imagine how soft it can be. One look at your photos and I can tell just how soft it really is. Beautiful pairing Katie! Such a fun and playful look! I love that you have a striped tee collection, I can never get enough! This skirt is just gorgeous! I love the velvet and the color is perfect! Hope that you are having a great week so far :) We have had a break with the heat and humidity and had some rain which has been a wonderful relief! The rain is very welcome here! 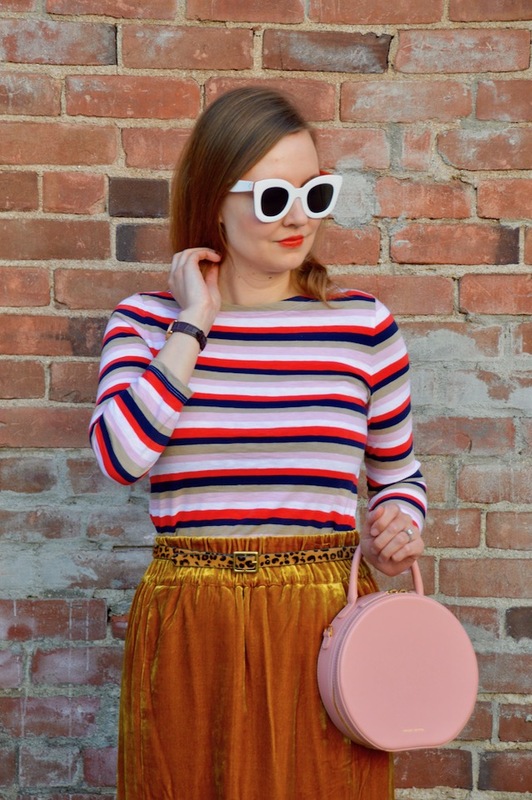 Of course I'm drawn to the stripes and velvet post – it's within my comfort zone. I would love a velvet skirt and this one is quite nice. May need to stop into my J.Crew this week. I like your leopard belt for the contrast, but, for me, I wouldn't feel right. Still a nice inspirational outfit and I like it very much. Wonderful mix of colors Katie! 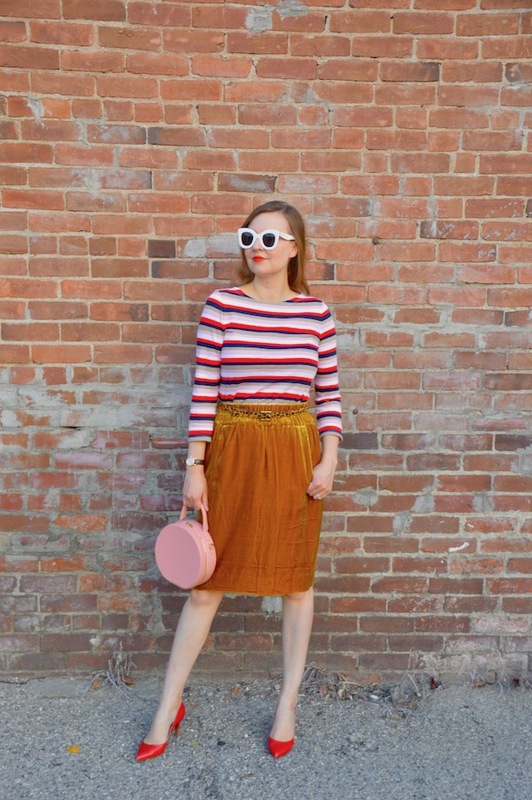 I can't get enough of mustard yellow either and love your skirt! I know what you mean about raining and blog pics, it is supposed to do that most of the week.